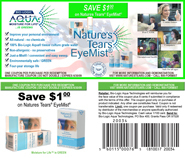 Bio-Logic Aqua Research and Nature's Tears EyeMist have developed much new information on driving and eyesight. This information can help drivers prevent or relieve tired, strained, irritated "Trucker's Eyes" on long distance trips (and they don't involve coffee or eye drops). Even if you don't follow the recommendations to the letter, you never know when the information might come in handy or prevent an accident. Several environmental factors in the truck cabin can lower air humidity and therefore increase in the rate of moisture (water) evaporation from the protective tear film covering the eyes. The tear film is amazingly complex, even though it is only about five microns (millionths of a meter) thick, and it doesn't take much water evaporation to cause discomfort, fatigue and blurred vision. Lack of adequate tear film moisture is called, "dry eye," "dry eye disease," "dry eye syndrome" or "trucker's dry eye." The most physically irritating result of tear film water loss is an over-concentration of electrolyte (salt). The results are itching and burning eyes, eye-strain, blurred vision, fatigue and other symptoms. The easiest way to prevent tear film water loss is to mist with Nature's Tears EyeMist whenever discomfort is felt. This unique water mist penetrates the tear film with just the right amount of natural water - without flooding. And best of all, you can apply the mist while driving! Even if you use eye drops, they will be more effective if you apply Nature's Tears EyeMist first. Because Nature's Tears EyeMist has no dosage limit, you may also mist between eye drop applications. Mist whenever eye discomfort is felt and or as a preventative before you feel discomfort. And remember: Nature's Tears EyeMist cannot be over-applied. Smoking while driving is especially unhealthy because of the confined space. In addition to damaging lungs and heart, cigarette smoke is extremely irritating to the eyes - even with a window opened. Keep Nature's Tears EyeMist handy. Mist when you get up in the morning, after naps, after showering or cleansing, whenever eyes or face feel tired or uncomfortable, and three or four times a day as you drive as a preventative. Breathe the mist in deeply, following the Yoga technique of inhaling through the nose and exhaling through the mouth.